After a week of freezing rain and ice followed by snow and more snow and frigid frostbite temperatures, Bookman and I were starting to feel the winter blahs. To help in their alleviation, we had a picnic today. On the living room floor. No mosquitoes. No ants. Just a couple cats trying to mooch off our plates. Only in winter can one wear flannel pajamas to a picnic. Bookman made seitan salad on onion bagels with apple slices and salt and vinegar chips on the side for a special treat. For dessert there was homemade ice cream. To add to the picnic ambience, we found a YouTube video of a lovely sunny woods with mossy trees, bluebells and birds singing. The actual weather outside helped too by being sunny and warm 30F/-1C. It was all quite nice and our spirits feel lifted for it. Seeing as how the weather was so pleasant today, the Dashwoods even got to come out and enjoy some sunshine. There is snow everywhere and they were not pleased by that but they so badly wanted to be out they were not going to be stopped. At one point all four of them were perched in the sun on the deck stairs happily preening their feathers. They also got a cabbage hung up in their run today. Hanging cabbage isn’t such a novelty anymore so they don’t go completely bonkers over it. They have also figured out how to negotiate the swinging and grab pieces off it at the same time. And it is no longer something that must be devoured all at once. With the run door open they’d go in and out, take a bite, wander back into the garden, and then go back again later for more. We had a visit from the cute two-year-old girl and her mom a few houses down from us. She has been sad she hasn’t been able to see the chickens lately because they have been in the plastic shrouded run. They saw the Dashwoods were out and they walked over to say hi. It just so happened we had an egg. We gave it to her and she thought it was pretty neat in the way of two-year-olds who are tired and suddenly shy. All of the seeds I ordered have arrived. Seed companies like to send a packet of free seeds when you order. It’s always fun to get some random seeds you might not have ever bought. One year we got a yellow summer squash that was pretty tasty. Another year we got some flower seeds. This year we got cosmic purple carrots. It could not have been more perfect. I was going to order some but decided not to because I already had some atomic red carrot seeds from last year and I was ordering some oxheart carrots (they are round like a big radish instead of long) and how many carrots does one really need in a small garden? But I got my cosmic purple anyway. Woo! Carrots are one of the vegetables that a person with a winter greenhouse can grow. I have been meaning to try making a winter bed with a small grow house over it for a number of years but just haven’t managed it, we’ll call it chicken interruptus. We will also call it lazy. So it is with great interest that I am following a Minneapolis walipini story. A walipini is not a vegetable and don’t worry if you have never heard of it, I hadn’t either. A walipini is a sunken greenhouse that uses passive solar heating to keep it warm. In community with a nearby church, someone built one in their backyard to go along with the large community garden on the church property. It gets so warm in there during the winter that they can grow tomatoes! It was built in 2015 out of mostly salvaged materials. Before building, they checked with the city to find out if a permit was needed but were told they didn’t need one because the city didn’t have any rules regulating sunken greenhouses. Since then they have had many curious visitors interested in how it works and how to build it. And they have had at least one complaint. The city will not disclose the exact number, only that there has been one. Because of the complaint(s), the city is now studying the issue and have told a few other residents who had begun digging to build their own walipinis that they had to stop. Urban agriculture was legalized in 2012, and this is viewed by urban growers as part of the urban agriculture movement. Hopefully the city sees it the same way. A decision from the city council is expected by spring. As much as I would love my own walipini, I simply don’t have the space for it. But then I didn’t have the space for chickens until recently when we knocked down our garage. I have nothing left to knock down. Unless I take out my deck, replace it with steps into the garden and a small patio right in front of the walipini windows. I could use the deck lumber as framing for the walipini. Well now, isn’t that a thought? I miss riding outdoors. Yesterday I had an epic trainer ride. I planned on riding for six hours however far that took me. It ended up taking me 112.5 miles/181 km with a little over 5,000 feet/1,524 m of climbing. Yes, I was tired but kind of bored by the end too. I stopped only for a quick bathroom break and because of an incident. I was 4 1/2 hours in and cruising along in the zone when, CRASH! My first reaction was to grab the brakes on Astrid to…stop? And then I realize, wait, I’m on a trainer, I don’t have to stop because I am not going anywhere. That gives you an idea how far out in the zone I was. I jump off the trainer and run into the bedroom from whence the crash had come. Sitting on the bed looking a bit ruffled, expecting to get yelled at and trying to look cute and innocent at the same time, was Waldo. In pieces on the floor with a large puddle of water spilled across the room, was the humidifier. I had no time to spare, I had to get back to my ride before my muscles began to cool off and tighten up. I picked up the broken pieces, tossed down towels, swish, swish, swish. Tossed the now wet and heavy towels into the bathtub and jumped back on the bike. Four minutes. It took a little longer than that to get my brain back in the groove, but it all ended up ok. Except for the poor humidifier. We went out and bought a new one today. And Waldo, he’s been especially affectionate ever since. It won’t last, but it is funny watching him try to make up for his naughtiness. Could be several points of interest here for you and Miranda. Cats, biking, gardens, chickens, winter indoor picnics – how many blogs have that much interest all in one? Hi – Ellen here – hit reply instead of forward. Haven’t forgotten about promise re Solnit’s book. Will return…. I love the idea of having an indoor winter picnic! I’ll have to try that! biblioglobal, it’s amazing what a change in where you eat lunch can make! The image of the chickens figuring out how to get pieces off the cabbage despite its swinging makes me think of the scene in Firefly when River gets an ice planet and says “this food is problematic” because she can’t figure out how to eat it. Jeanne, Ha! Oh that made me laugh! I’m pretty sure the notion of laziness is entirely irrelevant to you, Stephanie! But feeling the winter blahs here too and I think rest is an important part of respecting seasonal rhythms. Thanks for the walpini link. Another garden element to fantasise about. I’ll be glad if I just manage to get the massive ivy hedge removed and get a pear tree in there instead. I’m intrigued by what you say about urban agriculture being legalised in 2012. Was it illegal prior to that? Or just not regulated? I mean, was there a ban on growing tomatoes in your backyard? I can’t imagine it. Maggie, oh don’t be so sure, I can be pretty darn lazy! Oh I do not envy you removing that ivy hedge. I should have explained a little in the post about urban agriculture. To the city there is gardening and urban agriculture. Gardening is growing your own food for yourself to eat. Never a problem, and we are even free to do it in our front yards. Urban agriculture is growing food to sell – urban farming. You can now do this in your backyard, or lease one of many empty urban lots the city has up for grabs each year. And then you can put up a food stand and sell your produce. It’s pretty awesome. I love your picnic idea. My wife and I also tend to a lot of creative meal planning and eating. 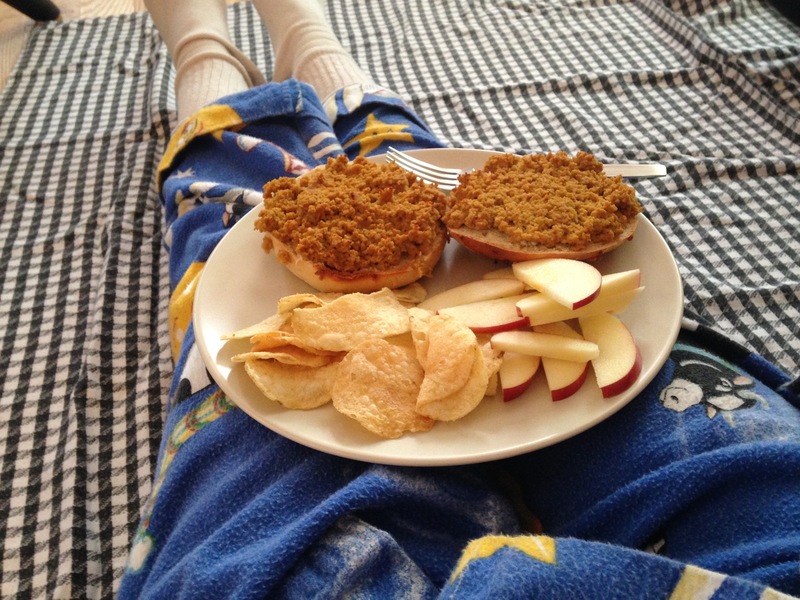 Meals in pajamas and comfortable clothes are the best! The weather here on Long Island is crazy. It was 5 degrees a week ago, but it has been in the fifties since. We then had snow. Happily have been able to engage in a moderate amount of outdoor activity. AM glad your weather has been a bit less appalling and that you had a delightful sounding picnic. Cats do mooch so wonderfully! Loved the image of the Dashwoods preening together on the deck chairs! Ian, a bit less appalling, I like how you put that! 😀 Once the cats realized there was nothing worth mooching they wandered off to find trouble elsewhere. The preening Dashwoods were delightful and made me really happy to see them feeling so good and enjoying the sunshine. Thanks Brian Joseph! Creative meal planning can really change things up, lift the spirits and add some fun into what is generally a routine thing. Glad to hear you and your wife do the same! I envy you your temperatures! We won’t see 50s until March. Probably. With the way climate change has been affecting our weather over the years, there is no normal anymore. When I was a child, I had a book where the family planned to go on a picnic but something happened (rain?). They didn’t want to disappoint the children, so they had a picnic indoors. Jack and I have done that a few times. They’re a lot of fun. What complaint could anyone have about a walipini? A sky scraper, but not a sunken garden! Joan, more people should do indoor picnics! Apparently someone thought the walipini an eyesore or something. The city won’t say exactly and I am not sure why. I am hoping it is just a matter of it being a new thing and people just not being used to the way it looks. An indoor Winter picnic, that sounds lovely!😊 Also I can just imagine the Dashwoods in their Winter home eating cabbage. All grown by now probably? Hope you get to cycle outdoors again soon. It’s snowy here but not too cold. Bina, it certainly went a long way to lift our spirits! Oh yes, the Dashwoods are all grown up even if they still don;t know how to roost. I won;t be able to cycle outdoors again until March at the earliest but that’s not so very far away 🙂 snowy but not cold, I’d be ok with that! A winter indoor picnic!! What an awesome idea. if its sunny next weekend, I will strong arm my flatmate in doing that. I just discovered purple carrots like on Friday. A colleagues mum made some sticky pudding type popular sweet dish, that is usually made out of red carrots, with purple carrots and they were DELICIOUS!! I love how Waldo looks and acts after such an incident. Its usually the way I behave after I have broken a piece of a cutlery of forgotten to pay some bill my flatmate who as you know is like an elder sister has been nagging me about!! I’d love to see Waldo bring to make up for his naughtiness. We have a regular cate visitor at present. We are not cat people – both being allergic to them – but I do like to watch them. Next door has two or three cats and their tortoiseshell seems to have taken ownership of our backyard now we have no dog. It’s very hot here at present, but in the evenings, after the sun has gone down it goes to our unused brick built in barbecue and settles in there. Clearly the bricks are warm, and it can survey the scene from there. Love it. And, I’ve never heard of a walpini before. I loved the story about the 2-year-old and about the Dashwoods enjoying the weather (and learning about the hanging cabbage). whisperinggums, Waldo knows how to turn on the charm and most of the time I can’t help but laugh so I guess it works 🙂 Your cat visitor has found a great place to hang out by the sound of it. too bad you are allergic, but at least you can enjoy her presence from a distance. Come spring when the snow is gone and the weather warmer, we’ll have to invite the 2-year-old to meet the Dashwoods up close and personal. She’s just a tiny thing though so maybe we’ll wait until she is taller and the chickens can’t jump in her face. Wouldn’t want an incident to spoil her enjoyment of them! That’s a lovely idea but as you say she’ll have to be big enough. She’ll be growing quickly though won’t she? Yes, I am sure she will, if not by spring then by summer should think. I suspect you are right. We’ll all look forward to that story. Love the picnic idea and your food looks so yummy! Now that’s a good way to enjoy a weekend and make it memorable! Thanks Iliana! It did go a long way to chasing away the blahs. An indoor picnic sounds the perfect antidote to January cold (and ice!). I like that idea, but somehow I think I would feel silly doing it all on my own–so I shall live vicariously through you! 🙂 Those apple slices are absolutely perfect–they are cut so evenly (yes, I am weird, but they are pretty). When you cycle so long indoors do you at least listen to music? That is a big undertaking–I totally admire you for it! Danielle, hmm, yes, picnics are generally better with two or more people. You could have a pseudo-picnic at one of your various coffee shops! I love apple slices and Bookman is an ace at cutting them. Oh, yes, when cycling indoors I have a large workout playlist that goes for hours and sometimes I watch a cycling movie on netflix when one I haven’t seen yet comes up.